I’ve had a few comments on my You-Tube videos asking for information on where I fish on a specific Urban Lake. The answer isn’t necessarily where I fish on any one of the Urban Lakes, but how I fish the lake. 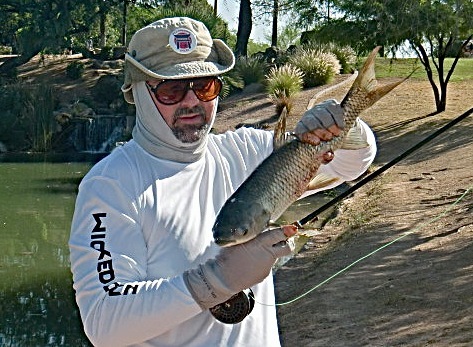 In the next few articles, I’ll try to share my techniques and hopefully make your Arizona Urban Lake fishing (now called “Community Lake Fishing”more satisfying. First and foremost, I loved the Arizona Urban Lake program. In fact, having relocated back to New Jersey it is probably the one thing I miss the most about living in Arizona. The Urban Lakes were my go-to fishing water. Any time I could spare even as little as an hour I would be on one of the lakes. And that is the first consideration as to how I would fish any of the lakes; time. If I had two hours to travel and fish I would fish the Urban Lakes with a “Once-around” strategy. On days that I had three to four hours to fish (again with about and hour travel), I would either fish one of the lakes with more attention to detail or plan on fishing two of the Urban Lakes. 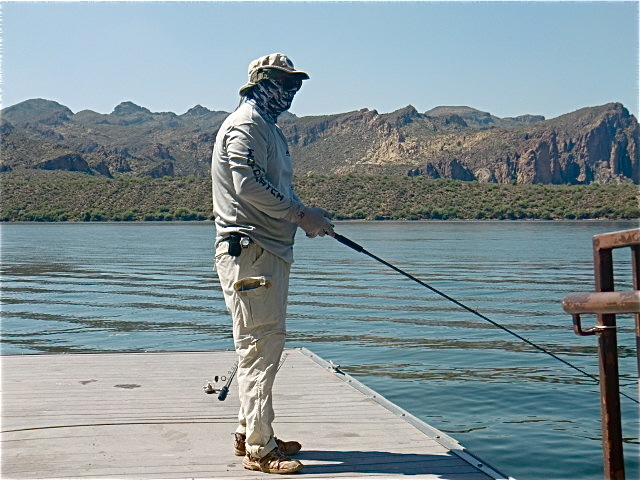 Days where I could devote at least five hours to fishing, I would fish the “big-waters” – Lower Salt River, Canyon Lake or Apache Lake. What is my “Once-around” fishing method? As to Urban Lake selection, the three closest lakes to my home which was in San Tan Valley were: Veteran’s Oasis, Water Ranch and a small Urban Pond in Gilbert. I do not name it here as fishing pressure really put a damper on fruitful days spent there; however, those that are curious can read any of my past fishing journals and get the name. Generally speaking, these lakes were more often than not my “once-around” lakes.Additionally, depending on where my work took me, I would get some fishing in on another Urban Lake. For example, if I had to be in Mesa, I would fish Red Mountain Lake before my work. Lastly, time of day was not a factor, if my mornings started too early to fish, then I would fish at night. I would also pre-rig two bait casting rods. The pre-rig would depend on the species. Bait caster # 2 – usually with a spinnerbait or a soft plastic lure to use as a follow-up to rod number 1. Bait caster # 1: curved hook heavily weighted and baited with week old shrimp that I would salt. Bait caster # 2: rigged for Largemouth bass to fish while my bait was in the water waiting for catfish. Fly Rod # 2: a 7 foot fly rod with a 6X tippet with a dry fly and dropper combination. The dry fly is usually a hopper, or large ant pattern. Once on the water, I start on the water as close to the parking lot as possible. I usually start with the fly rod to see if there’s any fish around. I hope for blue gill or small bass that may provide forage for larger fish. After a few casts, I’ll follow up with the rattle trap or popper. In all instances I start closest to shoreline and work my way out. After six to ten casts I move on a few feet. You MUST be careful walking the edge of the Urban Lakes as many times fish will hold close to shore and be easily spooked! In this manner I work my way around the entire lake. In most instances this takes about an hour. Based upon my experience, I have my “honey-holes” on each lake. Naturally I’ll fish them a little longer than other areas. But, the key concept is to fish as much water in the time available as possible. If I loose confidence in any of my pre-rigged lures, I’ll change them. Circumstances may also dictate this. For example, if I’m catching small bass on a red streamer and have a chrome blue rattle trap on my bait caster, I’ll change that to something that is either red or includes red such as a “bleeding” pattern. That basically summarizes my “Once-around” strategy for those days when I really do not have a lot of time to fish. If its one of those days when I really want to fell a tug on the line, I’ll spend the last few minutes of an outing with the fly rod playing with, catching and releasing blue gill. After all they decades of fishing, they always put a smile on my face on otherwise fish-less days. Here it is. My first fishing journal since relocating back to New Jersey. Admittedly, this is long over due. A few unexpected events delayed our getting out on the water. During this delay, I day-dreamed of catching and releasing plentiful large trout and bass from the waters I fished in my youth. 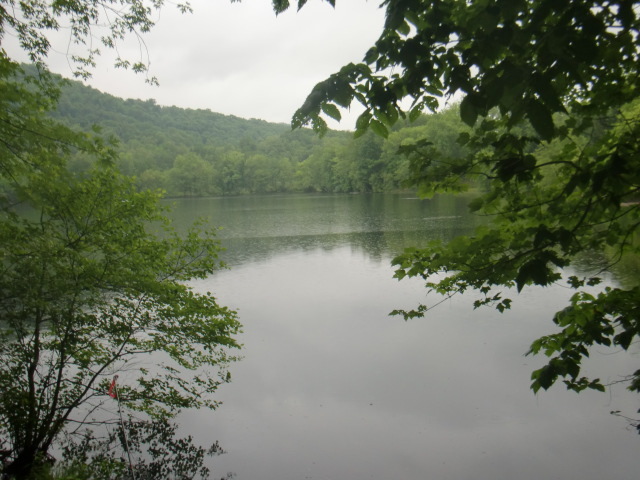 Many a mental fishing trip took place on the Big Flatbrook, the Musconetcong and Susquehanna Rivers, Greenwood Lake and Monksville Reservoir. Alas, once we were (finally) able to get out and fish, the spring trout season was over. 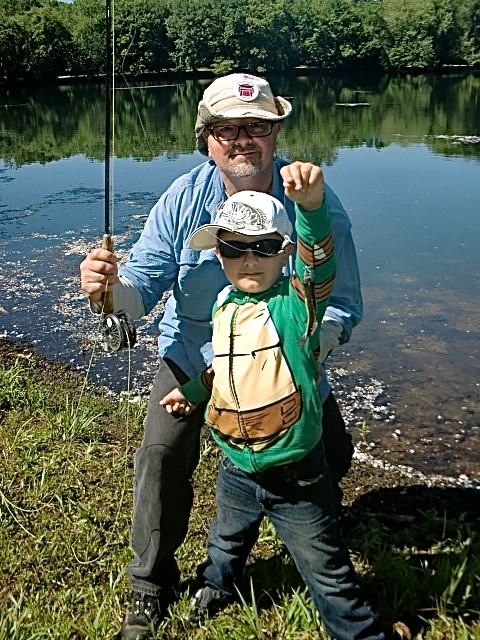 As an added measure to the joy of fishing, our little grandson joins us on the water this year. We also began the season with a new member, a Brazilian Terrier pup we rescued from the Secuacus Animal Shelter. Maharet now joins the FFD team. 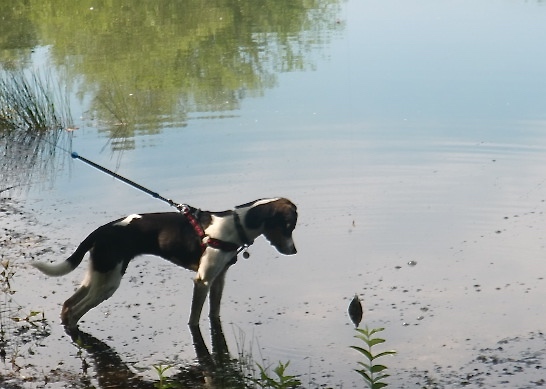 Chloe, who passed away in 2013 was our constant fishing companion. Maharet will have some mighty big paws to fill. 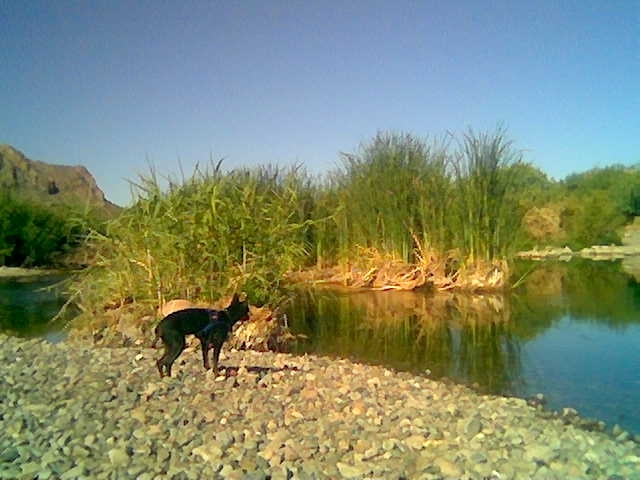 Chloe helps locate fish on the Lower Salt River. It was also time to fish with a new mindset. 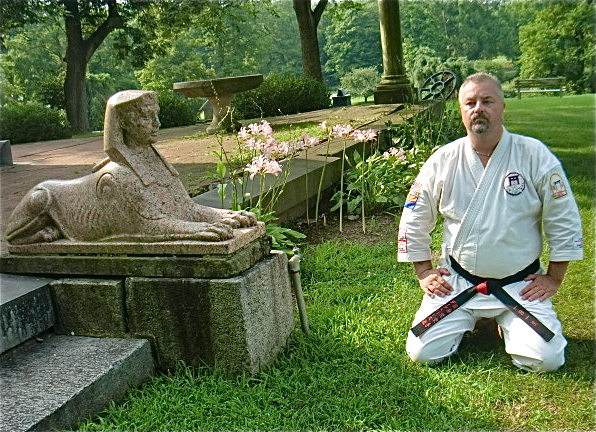 I took my own advice and fished with the mind-of-a-white belt. (Click this link for my article on this topic https://flyfishingdojo.com/2012/05/16/fish-like-a-white-belt/ ). We fished new waters. Catches were small and sporadic at first. A few of the early days we were skunked-out. 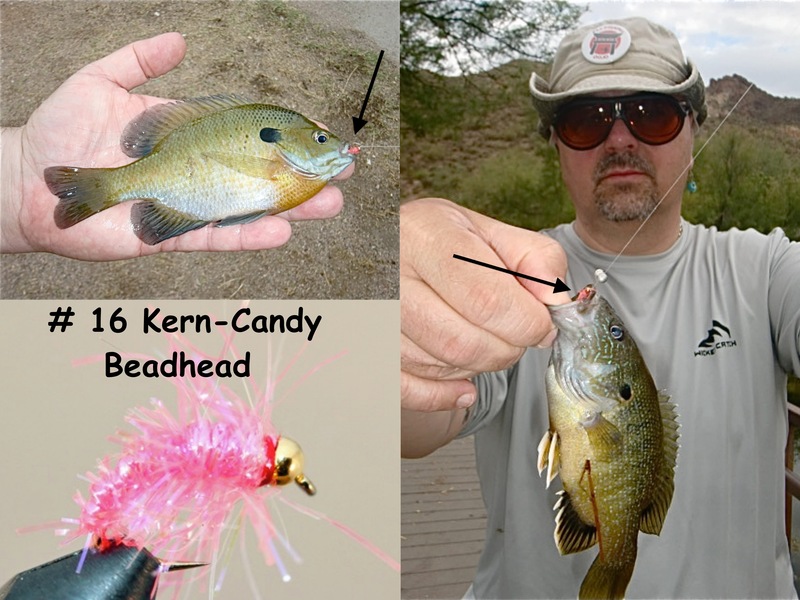 Catches naturally, and thankfully included bluegill (click this link for an article on the perception of bluegill fishing https://flyfishingdojo.com/2015/06/29/bluegills-warlords-2/), shad, small pickerel (a species not found in Arizona, thus the first one I’ve caught in ten years) and small bass. Although, we’ve began to experience more consistent and bigger catches, results are still mixed. As such, rather than name our fishing spots, in this post, I’ll simply refer to them as Lake numbers 1 through 4. 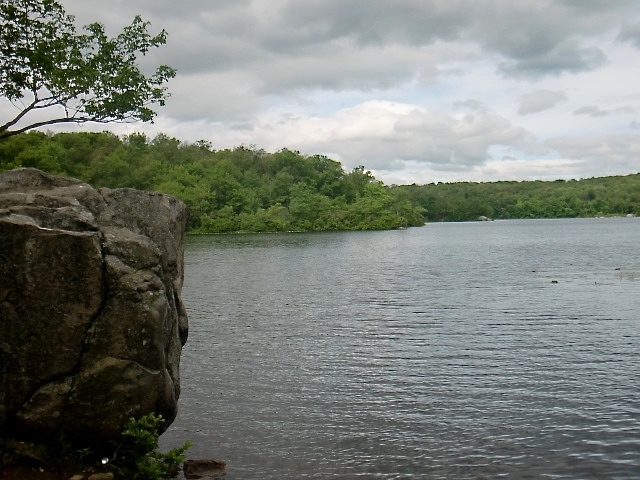 Lake number 1 is an urban lake and easily accessible from our home in Bergen County. It is a small catch and release lake. I’ve been able to fish this lake before and after work. This lake also provides quick, impromptu fishing while my grandson is on summer vacation from school. In the weeks to come, this lake will become my quick go-to lake for regular fishing. Our initial catches were small to respectable. I did see a few bait fisherman catch and release largemouth in the four to four and a half pound range (as weighed prior to release). The trick for me will be to catch fish this size on artificial lures or flies. 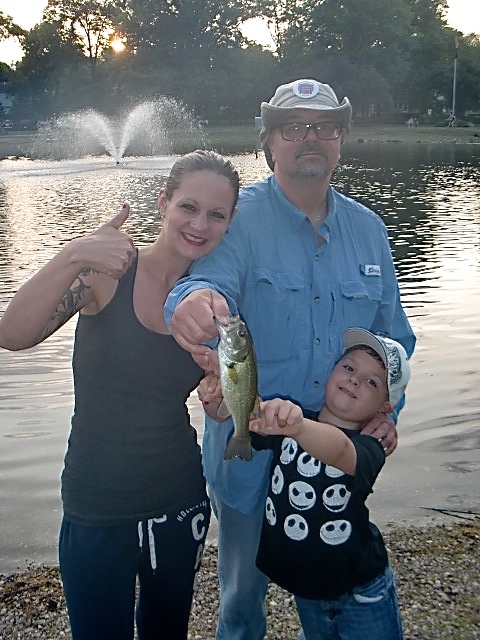 Our daughter and grandson caught their first bass together. 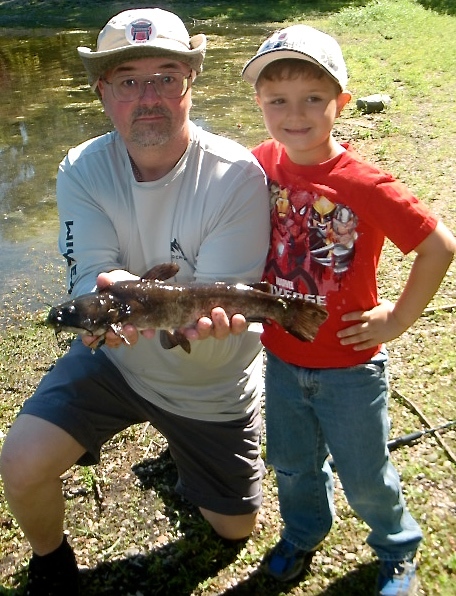 One surprising catch (and a joy for my grandson) was a catfish caught using a # 16 pink shrimp pattern. 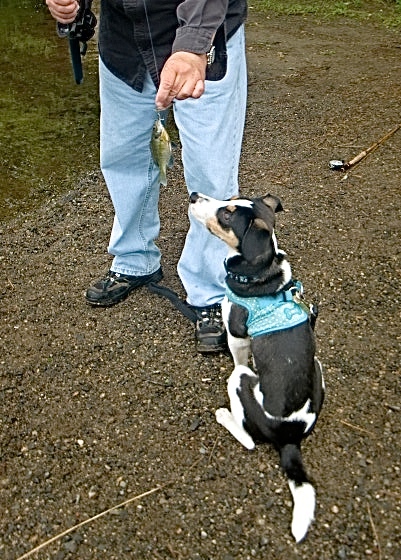 The few times we were able to fish, we caught an abundance of prey is, bluegill and shad, on various flies. This was the most popular set-up. 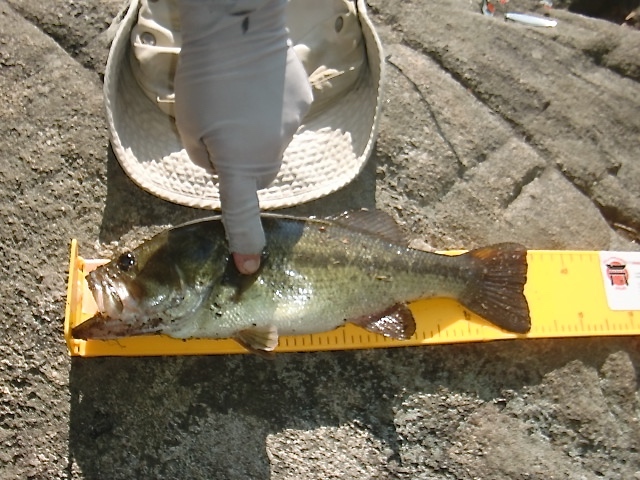 As we became more familiar with this lake, we began to catch larger and larger bass. The really big ones still evade us as of this writing. Internet searches result in people reporting large pickerel. I remain hopeful. Lake # 3 is easily accessible. It is only a short hike from the parking lot. For this reason it has more fishing pressure than Lake 2 and 4, but not as much as Lake 1. So far catches have been small. 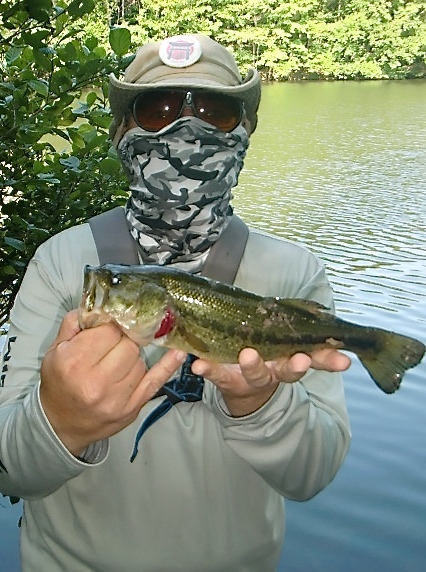 On two occasions, I saw other fisherman catch and release bass in the two pound range using soft plastics. My favorite days on this lake so far have been those spent with my six tear old grandson catch and releasing bluegill on the fly. From the parking area for this lake, you can also access Lake # 4. I love when little fish take a big lure! Lake # 4 is about a one and a half to two mile hike up a mountain from Lake # 3. 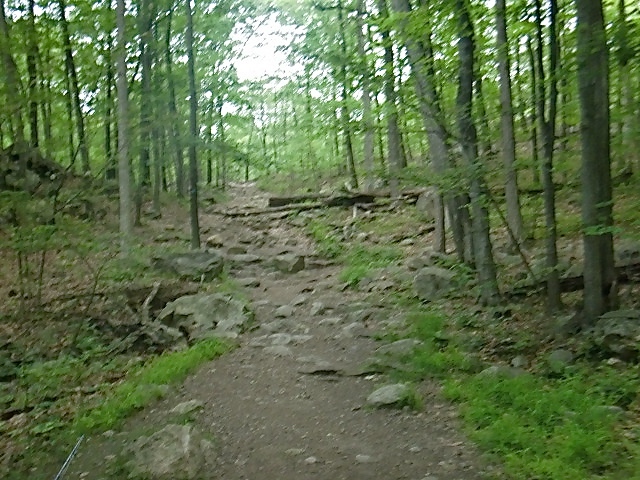 The hike is not as rugged as the hike to Lake #2; however, it is more vertical. While many hikers will take the trek to this lake, only those fisherman that are in some sort of physical shape venture up the mountain. To date this lake has produced the most reliable catches of respectable sized largemouth. A chartreuse spinnerbait with a white curly tail trailer produced my most productive day with six largemouth being caught and released. 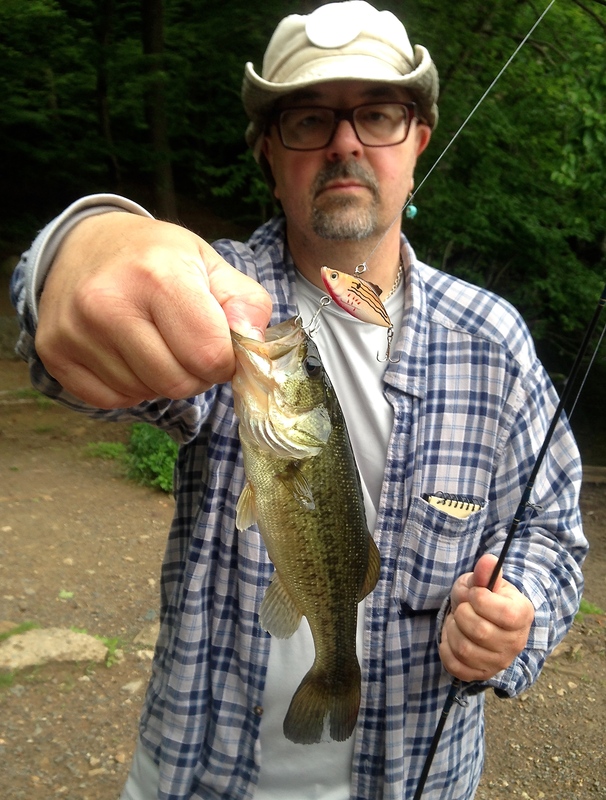 In addition, largemouth have been receptive to a streamer fished with a nymph dropper. A twitch and pause retrieve works best. 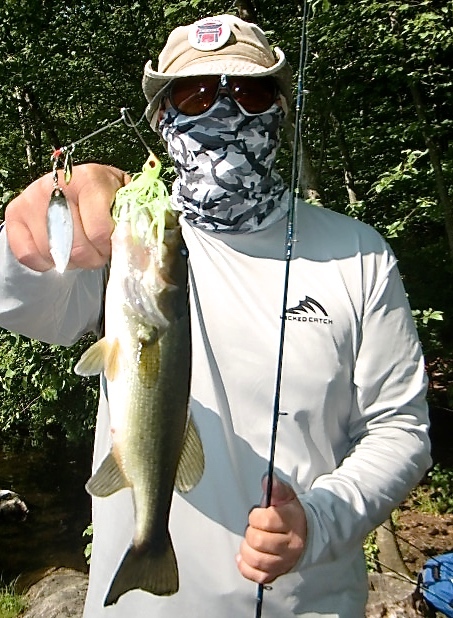 So, as August begins, I remain optimistic as to future catches of respectable bass and a few of those larger pickerel that are supposed to be present. In addition, I have a few trips planned to fly fish some of the salt water bays and see whats swimming around that may be enticed to take a fly. 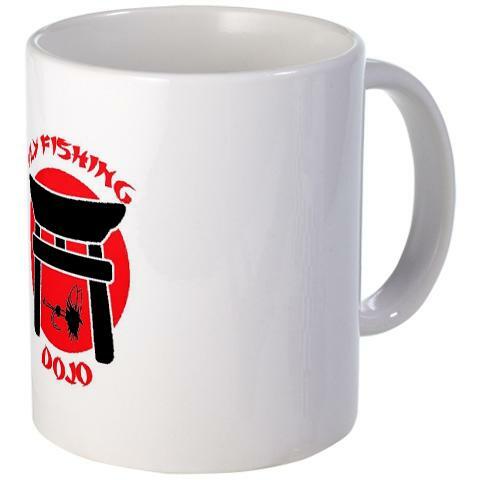 As a Thank-you for reading, I have listed a two-pack of FlyFishing Dojo on E-bay for only $ 1.75 which includes mailing. 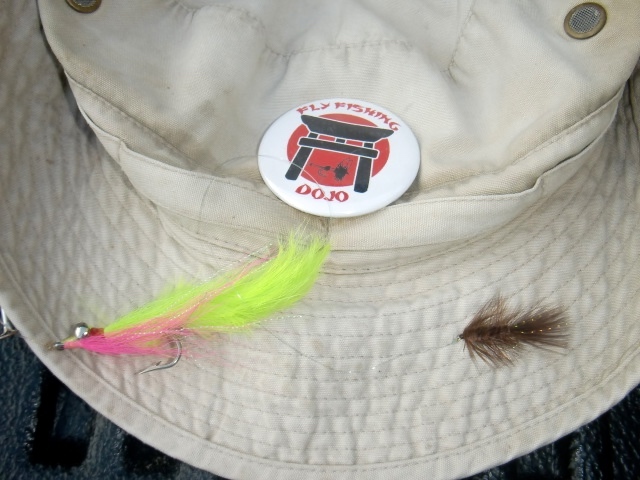 To get your FFD sticker two-pack, simply go to e-bay and search “Fishing stickers-FlyFishing Dojo Logo blog” – do not bid more than the $1.75, I’ll keep listing while supplies last. Sensei John is available for guest speaking engagements. Please see the “GUEST SPEAKING” Page tab above for more information. 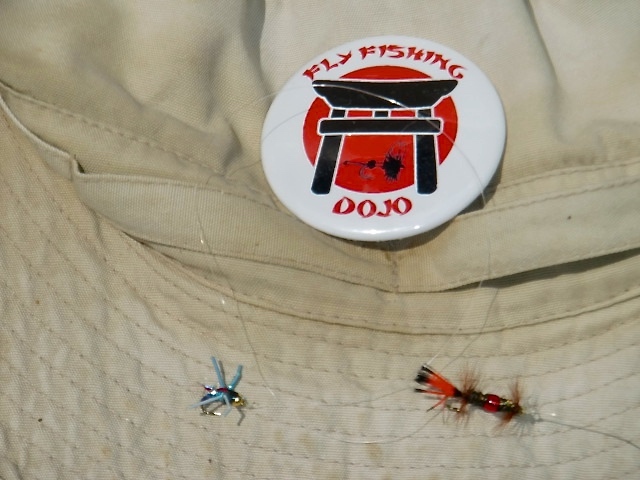 Follow FLY FISHING DOJO on FACEBOOK, please send a friend request on Facebook; see our “Video & Media” Page for more information. Please feel free to “window shop” our unique logo products by clicking on the “SHOP” page tab above. What does a fisherman catching a bluegill and a Daimyo (Warlord) ordering a Samurai to commit seppuku (ritual suicide) have in common? They are both affected by perception. 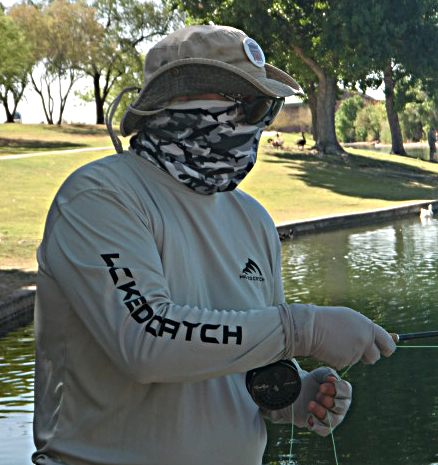 When I lived in Arizona, fishing in the hot dry summer months was summed up in one phrase – brutally tough. “Low” temperatures often hovered in the mid-ninety degree range and high temperatures, more often than not, exceed one hundred and five degrees. Though an occasional largemouth bass can be found in these extreme conditions, the most plentiful species is the humble bluegill. When fishing for bluegill, I adjust my tackle accordingly. I fish a ultra-light equipment with light leaders usually with a 7x or 8x tippet. Catching bluegill in this manner is productive and fun; with each bluegill released, my smile broadens and my mood relaxes more and more. What is different? It is still the same bluegill species that had me smiling all summer. It is still just as much fun to catch. But, it is not a rainbow trout. It is only a matter of perception. My perception of catching and releasing a bluegill has been altered. 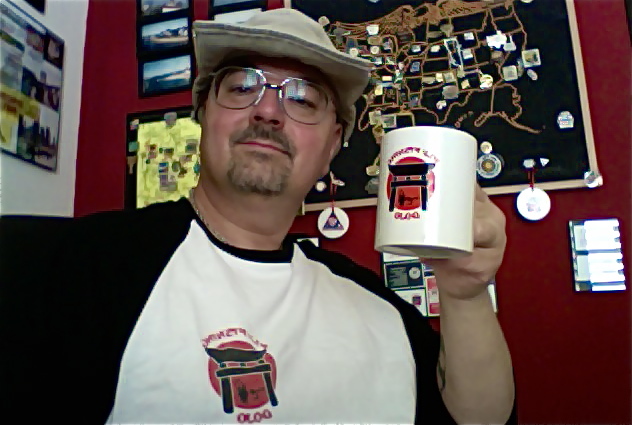 As I hit the keys of my laptop producing these words, it is early Spring. After a decade in Arizona, I’ve relocated back to my home state of New Jersey. As I reacquaint myself with the waters of my youth, one goal is ever-present; find fish. 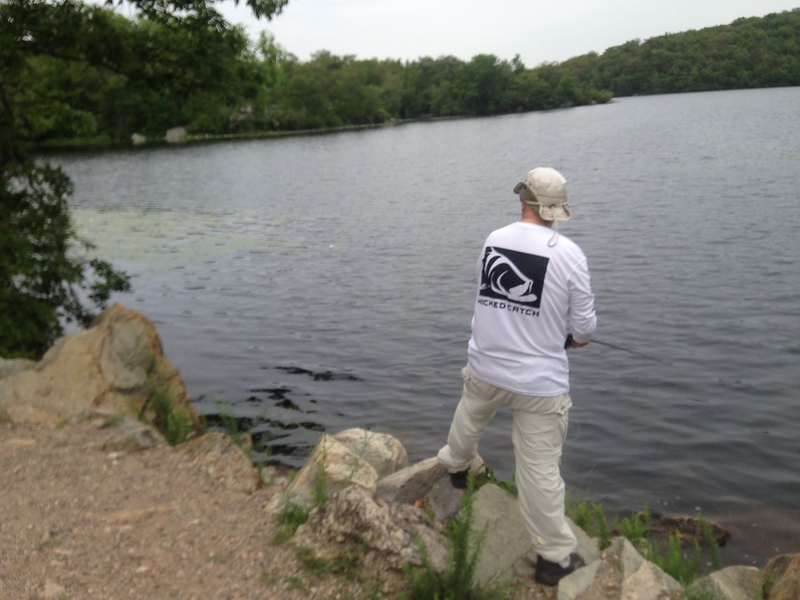 Though I’m presently targeting bass and pickerel, I am grateful for any tug on my line. That tug is more often than not provided by bluegill. 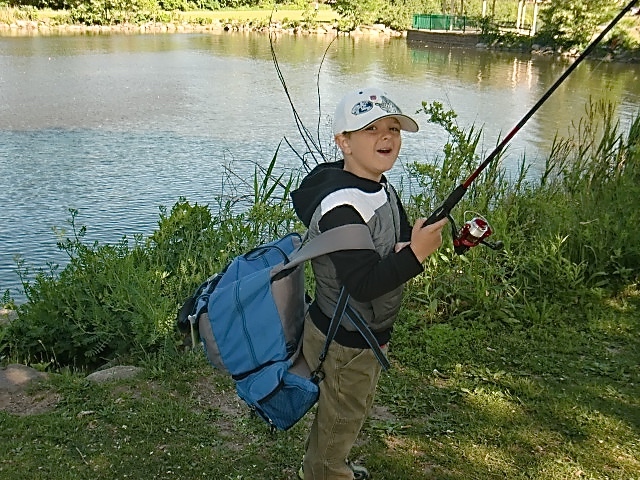 Whenever I am fortunate to have my six year old grandson fish with me, the one species that provides consistent action and mile-wide smiles and laughs is, well you already know. 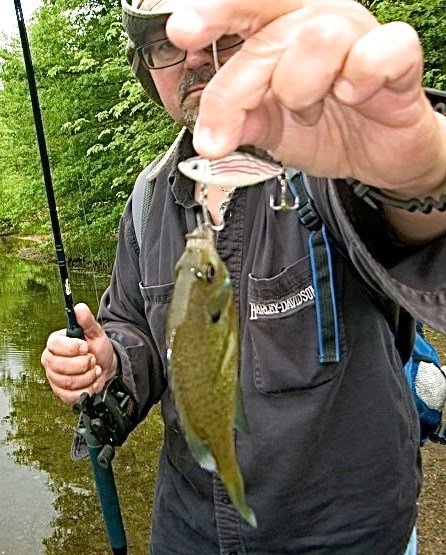 Ah, perception once again exalts the status of the bluegill. Perception affects not only how we technically fish but also how we react to the overall fishing experience. The ancient sages knew the power of perception. In fact, oral traditions and myths told of the ramifications of how perception shapes our world. Here is a mythical tale from the oral traditions of the martial arts that illustrates how perception can alter the manner in which you perceive a current event. The next time you fish, think of the tale and the manner in which perception affects your fishing reality. It is called the Daimyo and the Samurai. In feudal Japan there was a powerful daimyo, a warlord. Amongst his many retainers, the daimyo had an extremely loyal Samurai whom he favored. The samurai had accompanied the Daimyo to the Shogun’s Court in far off Edo, many days journey from their home. One day the samurai received an urgent message advising that his father, also a very distinguished samurai loyal to the daimyo’s family, had fallen gravely ill. Being in a hurry to attend to his dying father, the samurai desired to mount his horse and rush home. The samurai found that his horse had become lame and could not make the long journey home. Worried about seeing his ill father, the samurai made use of the daimyo’s favorite horse. This was a serious crime punishable by beheading. Business at the Shogun’s Court had concluded and the daimyo returned home to his castle. The samurai went to see his master and they walked in the daimyo’s gardens. The samurai saw the most lovely cherry blossom. He picked it and offered it to his master as a token of his appreciation, saying, “Amongst flowers, the cherry blossom; amongst men, you, my Lord and master.” The other samurai that were in attendance were shocked that he dared to pick a cherry blossom from the daimyo’s favorite tree. The daimyo took the proffered cherry blossom and praised the samurai for his generosity. As happens in all human relationships, the daimyo and the samurai eventually had a falling out. 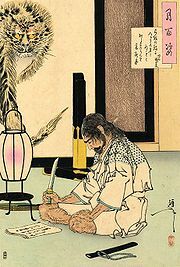 The daimyo angrily and publicly chastised the samurai, “You impudent servant, you disgraced me by making use of my horse.” “You insulted me by picking my own cherry blossom and giving it to me as a present.” In the presence of the daimyo’s court, the samurai was ordered to commit seppuku (ritual suicide). The next time you are on the water hunting for a game fish and are “only” catching “junk” fish, think about the Daimyo and the Samurai. Adjust your perception and relax and enjoy the simple pleasure of being outdoors, catching a fish. (See Endnote #1). I hope you enjoyed the tale and the within exploration as to how perception is a key ingredient in your fly fishing repertoire. In closing I remain, open to my perception of my world and wishing I could cast a fly into clear water and find a bluegill at the end of my line. 1. I had heard this fable several times in the Dojo. I was able to locate a similar tale, which you may also enjoy reading. It is called “The Thief Of The Peach” and may be found in: Furuya, Kensho, Kodo: Ancient Ways (Lessons In The Spiritual Life Of The Warrior/Martial Artist (O’Hara Publications, Inc., 1996) p. 48. What is this fishing characteristic? 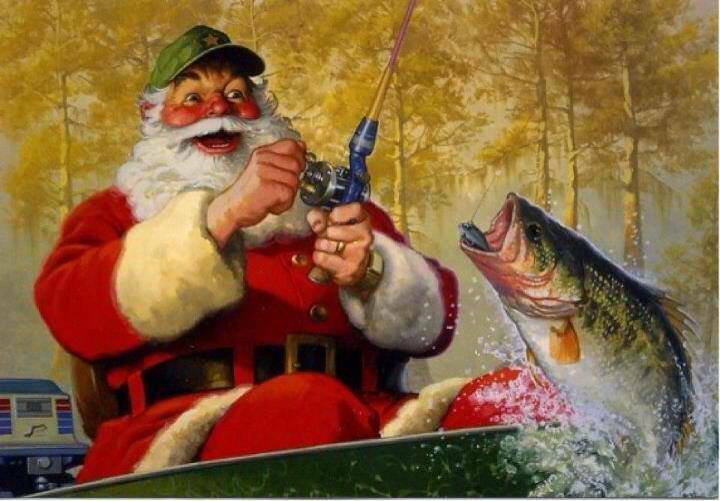 It is a yell, born of excitement or frustration that occurs when we fish. It does not matter if you fish with bait, a lure or a fly. 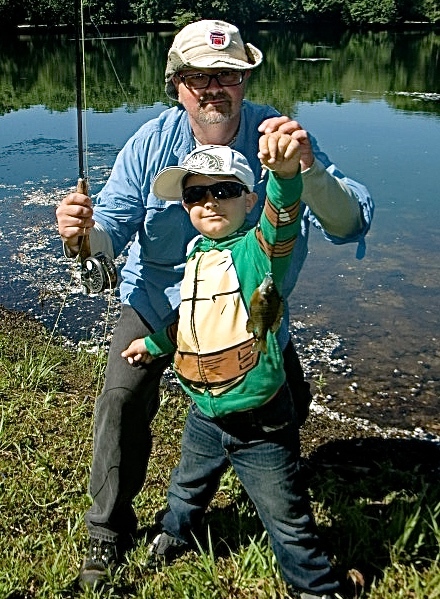 It matters not that you are young or old, a weekend angler or competitive tournament angler, anytime a fish bites and you set the hook, you will shout or yell. A few tournament fisherman have an almost trademark-type yell that is known by the public as specific to that fisherman. Kiai is therefore not simply yelling. It is a yell or shout derived from, and incorporating your internal spirit. It is completely different that a loud exclamation lacking of emotion. Spirit or emotion is the driving force behind the kiai. The physical source of the kiai is from the inhaled breath stored within your lower abdomen. (See Endnotes # 1). This is important because a poorly executed kiai which originates from your throat will produce a sore throat whereas a properly executed kiai will not. In addition to an expression of excitement or frustration there are other reasons to kiai. Within the martial arts, there are three reasons to kiai. They are, to scare your opponent, to boost your confidence and to provide or add to the strength of your technique. In fishing, only two of these three reasons are applicable. Since it could be argued that the fish is your opponent, while fishing, you would not kiai to scare your opponent. You may; however, wish to kiai to scare away those fisherman that are encroaching on your fishing waters, but perhaps that topic is best avoided. Similarly, adversity may come from factors within yourself. Even on a picture perfect day and conditions that are optimal, fishing can be difficult. During these times, you may experience negative emotions. You may begin to doubt your abilities, doubt your chances for success (“There’s only three hours in this tournament and there’s no way I can win.”) or you may simply prematurely accept defeat (“What’s the use of changing lures?”). At this time, a deep breath and a powerful kiai can snap you out of your negativity and turn your attitude into a positive one. During such times, I take two minutes to kiai, perform an aggressive form of Sanchin, called Shobu (combat) Sanchin and again kiai. Then, with my mind back in the game, I return to my fishing. 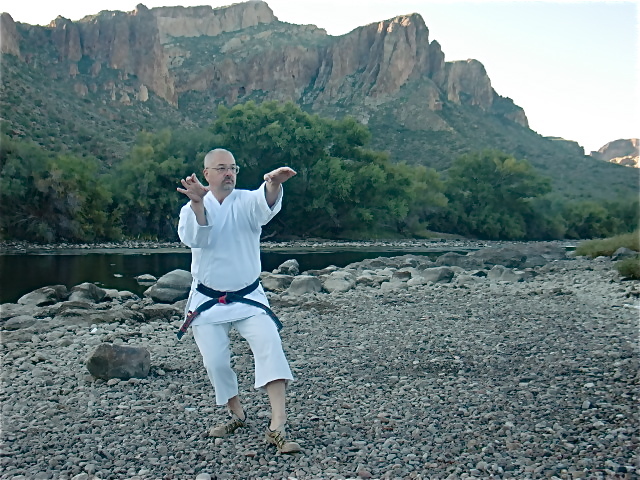 Here is a video of Shobu-sanchin filmed on the Lower Salt River, Arizona with watchful vultures. Kiai is also used when you find it necessary to increase your strength. Imagine a martial artist about to break bricks or a weightlifter lifting a tremendous weight over his head. Does he remain silent or does he yell and groan? Naturally he yells, grunts and groans. This is a clear example of kiai used for the purpose of increasing your strength. In fishing, you may encounter times when such a kiai is useful. If so, go ahead and kiai. This aspect of kiai is the one that is commonly manifested during the hook set. You finally feel a tug at the end of your line and your spirit swells from within and produces that kiai, that exclamation of excitement – “Yes”, “Fish-on”, “Got him”, etc. So, go ahead and kiai as you reel that fish in. Another aspect of kiai to to alert others to your predicament. In karate, very often the sound one produces with a kiai is akin to “ai-ya.” I have students modify this. When I teach children karate, I teach them to kiai the word “help.” Similarly, I teach adult students to kiai the word “fire.” Why? Again, the word itself has no effect on the kiai so use the word to your advantage. Most people that hear a child yell for help will look in that direction and offer assistance. However, “help” yelled by an adult may not elicit the same response, rather people may actually look away. Thus, the kiai of “fire.” Everyone looks to see where the fire is. Similarly, the word used in your fishing kiai should be of additional help to you. Once a fish is hooked, you want to alert your partner to that fact. Once alerted they can help land the fish. They may need to get the net or gaff, pull in other lines to avoid tangles, adjust boat position, and the like. A kiai of “Fish on!”or “Got one!” accomplishes this goal whereas “Yes! or “About time!” may not. So, enjoy your kiai. Kiai often with tight lines. In closing, I remain, casting, (hopefully) hooking, but always with kiai. 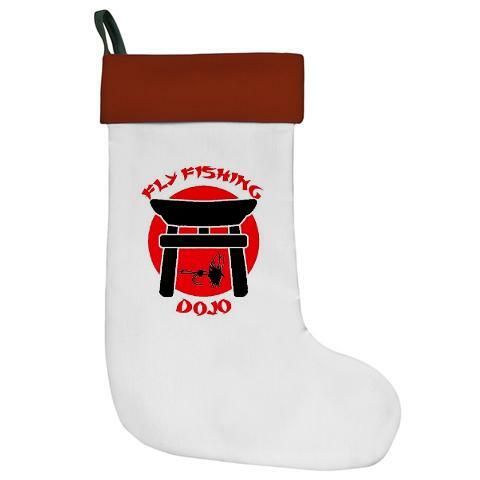 As a Thank-you for reading, I have listed a two-pack of FlyFishing Dojo on E-bay for only $ 1.75 which includes mailing. 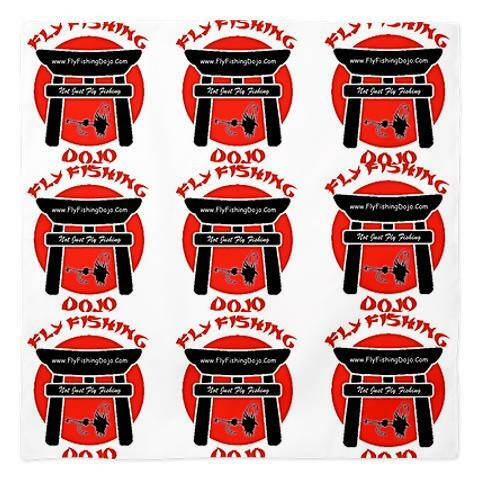 To get your FFD sticker two-pack, simply go to e-bay and search “Fishing stickers-FlyFishing Dojo Logo blog” – do not bid more than the $1.00, I’ll keep listing while supplies last. 2. Lyons, Nick (editor), Hemingway On Fishing, (The Lyons Press, 2000) p. 119. From “On Being Shot Again: A Gulf Stream Letter”, originally appearing in Esquire magazine, 1935. 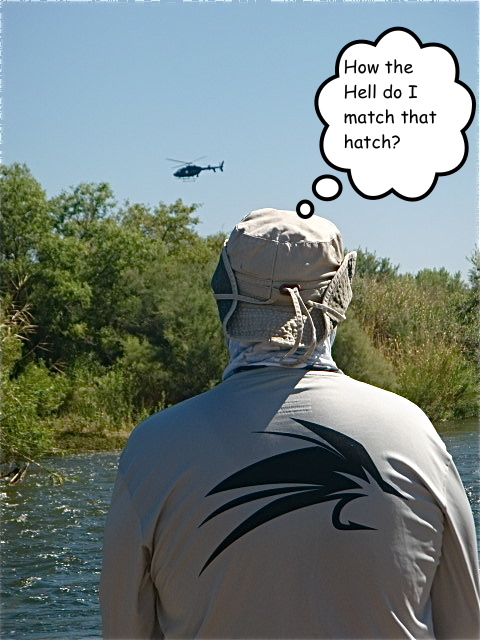 Now that I’m settled in in New Jersey, I wanted to post some final thoughts on fishing in Arizona. Simply put, I hated living in Arizona. It is dry, dusty and damnably hot. Having placed myself in a situation where relocating was not possible, I was doomed to try to endure. The one saving grace was fishing. During the triple digit temperatures of the Arizona summer, you would have to be out the door by four o’clock in the morning. This gave you at least until ten or so when triple digit heat would radiate from the Sun. I do not write about my intense dislike with living in Arizona to simply air my gripes in cyber-space. rather, I write of my dislike only to highlight the manner in which fishing provided if not an escape, then at least a respite. I write to that another, who is disillusioned with the Valley Of The Sun, might discover these words and be led to explore fishing in the desert. 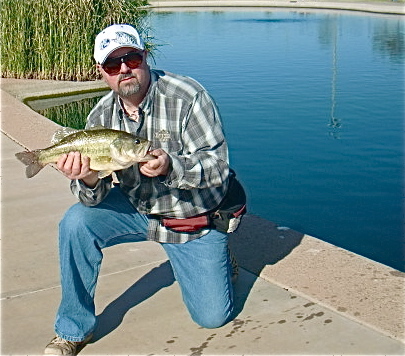 My first exposure to fishing in Arizona was through the Urban Lake System (now called the Community Fishing Program). Frankly, the lakes in this program were a God-send. They are easily accessible and extremely user friendly, even for the novice fisherman. They are regularly stocked with catfish in the summer and rainbow trout in the cooler winter months. 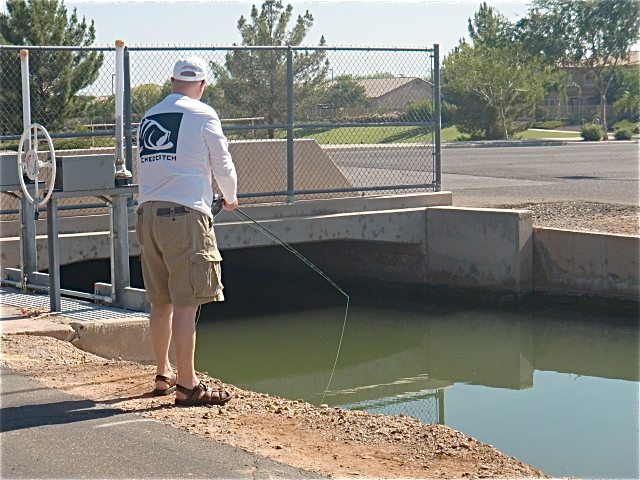 If you are an Arizona resident or winter visitor, you owe it to yourself to get the necessary (and relatively inexpensive) fishing license and try out one of your local Urban Lakes. 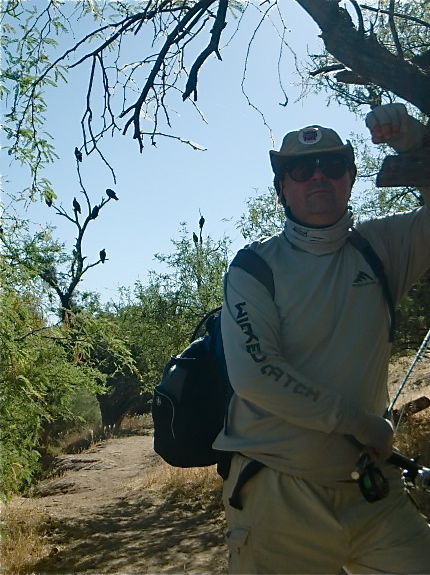 While many of the videos on my video page (see the tab above) show some of the Urban fishing, here is my most memorable catch, a huge catfish on a fly rod, yes, a fly rod, filmed at Red Mountain Lake in Mesa. Simply put, I cannot recommend the Community Lakes system enough for any Arizona resident, or winter visitor. While the Urban Lakes provided easy access fishing, the big waters provided the most beautiful experiences in spectacular natural environments. By the big waters I mean Canyon Lake, Saguaro Lake and my “watery-mistress”, the Lower Salt River. Even if you do not fish, take a ride and enjoy the day hiking at one of these locations. Not sure if its worth the trip? Then check out my fishing videos and see some unbelievable scenery. 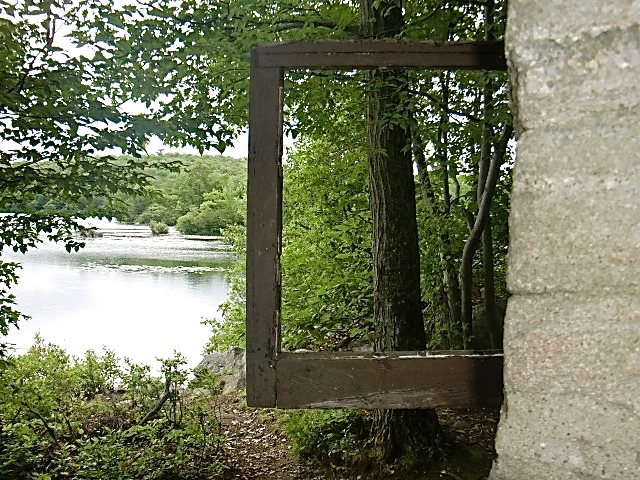 So spectacular is the scenery and so profound is the experience of being at these locations, that in addition to fishing, I often filmed my martial arts videos in these environments. Here is one of my most memorable filmed my very last day on the Lower Salt River amongst one of the many wild horse herds that call the river home. 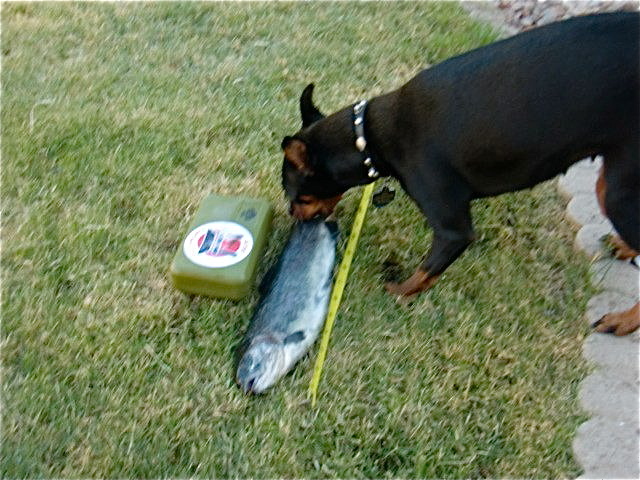 In the last few months of living in Arizona, I was exposed to a very unusual aspect of fishing. That is fly fishing for carp (both common and grass carp, or amur). You can find exciting fly fishing in almost any irrigation canal that is not posted otherwise but, I recommend you checkout SRP’s website for regulations and further details as ALL fishing is catch and release. In addition, you will find carp, and largemouth bass, at the lakes at ASU Research Center in Tempe, again, consult the local regulations. 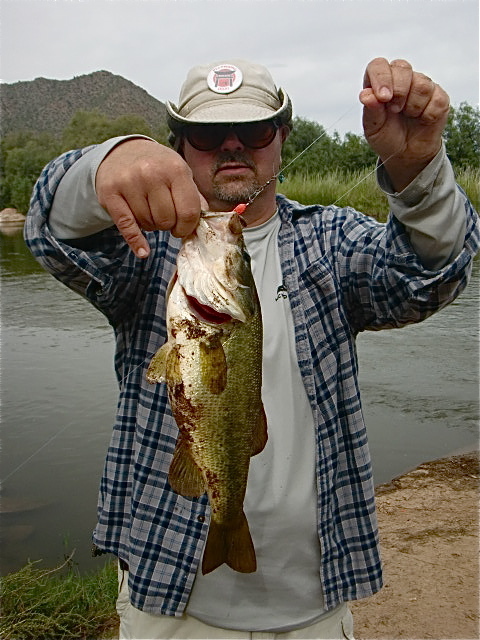 Checkout any of the articles in my Fishing Journals category prior to the date of this post and discover the therapeutic beauty of Arizona fishing. And so, with this post, I say “Au revoir Arizona.” In the next article, I’ll look to what’s ahead as I prepare to once again fish New Jersey waters, both fresh and salt. To all my readers, please accept my sincerest wishes for a joyous & peaceful, Christmas Season. This Christmas is particularly special for me. In the ten years since I moved to Arizona, it is only the second one that I will spend with family in New Jersey. The thought of being there when my five year old grandson opens his presents paints a profound smile on my face. Best of all, I have permanently relocated to, if not New Jersey, then the east coast. My very best wishes that we may embrace this Christmas with joy and hope. I’m even thinking of a white Christmas. To set the mood, please enjoy my Sanchin Kata with winter poems video.